Why is Spanish-language Radio so important in reaching the Hispanic Community and why should your business advertise on TIGRE 104.9 FM or TIGRE 102.1 FM? 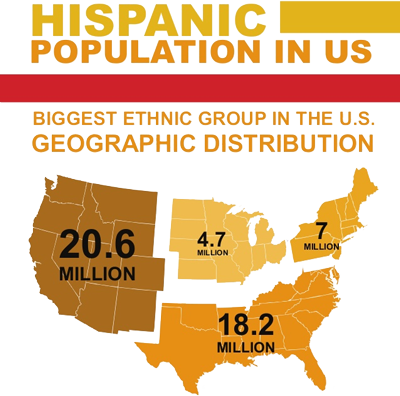 50% of U.S. Hispanics speak Spanish all or most of the time; 88% speak Spanish at least some of the time. Commercials in Spanish are 61% more effective at increasing awareness than those in English. Commercials in Spanish are 57% more likely to be recalled than those in English; commercials in Spanish are 4.5 times more Persuasive than those in English. 69% of U.S. Hispanics believe they get more information about a product when it is advertised to them in Spanish than in English. Source: 2006 Simmons Research; 2006 Roslow Research Group, Spanish v. English ad Effectiveness among Hispanics. Pare contactar nuestro departamento de ventas, mandenos un email a info@tigrecolorado.com y un vendedor les respondera para asegurarse que Tigre Radio cumpla sus necessidades de publicidad. Para acceso a nuestros Media Kits, llame al (970) 356 1450. Contact our sales department at info@tigrecolorado.com. We will respond to your inquiry and ensure TIGRE Radio fulfills your advertising needs. For access to our Media Kits, call (970) 356-1450.